I was able to try out these gummies, or I should say my son was able to try them. He has issues with regularity and as his Mommy it's been rough getting him to eat high fiber foods. He loves these chewy penguins! He gets three a day and that equals about the same as 1/2 cup of broccoli! Seriously this kid lets me know when it is time for his "gummies." He has been taking these for the past month and they have helped him tremendously! I loves these things and so does he! 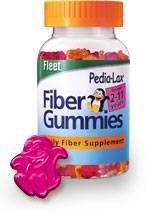 Also visit http://www.fibergummies.com to get a $1.00 off coupon! I received this bottle of Dry Spray Shampoo and gave it a test run. It's a spray powdery type stuff that soaks up the oil that builds up on the scalp after you go a day or so without a shampoo. I have crazy thick hair and I hate hate hate having to wash it every day, plus it gets incredibly dry. I heard about this product and was like "BINGO! Gotta try it out!" My test was simple and started the day after getting this in the mail. I didn't wash my hair the night before. First off, the fragrance is a bit strong but wasn't unpleasant. The application was pretty easy. Just a few spritzes along my roots and that was it! Then you let it dry and then comb out. It works perfectly! I had shiny, "clean" looking hair! I loved it! The only thing is that if your hair is super oily like mine can be, then you can only go a day without washing it. The Spray Shampoo can act as a refresher on that second day, so you don't look all scuzzy. If you don't have this problem then you could probably go a day more than this but I wouldn't recommend it. Bottom line is that this stuff works for me! I love my little bottle! I've been feeling like a zombie lately. 'Tis why I haven't been updating the ole blogeroonie! I'll be back to posting regularly tomorrow. I have some plans for some fun things, reviews, and whatnots! Stay tuned kids! I cannot believe how close it is to the read-a-thon! I'm ready like Spongebob!!! I'm ready I'm ready! My teaser is from The Fellowship of the Ring by Tolkien. I'm reading it (catching up actually) for the challenge! Here they are! "He paused, and then said slowly in a deep voice: 'This is the Master-ring, the One Ring to rule them all. This is the One Ring that he lost many ages ago, to the great weakening of his power. 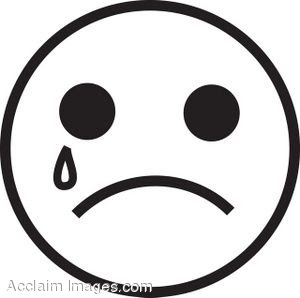 He greatly desires it--but he must not get it." When young New Orleans lawyer Bradley Harrington Chester III lies dying in the street after being hit by a speeding car, it seems that his life is over. But as his spirit drifts away toward a distant light, he is approached by an exotic fellow who claims to be both the Count Dracula of legend, and a violin player for The Techno Zombies, a Goth rock band on a world tour. The Count explains that with the aid of a wizard he has abandoned his dark legacy, and now finds himself in need of a legal representative. So he offers Brad a deal–Brad can shuffle off into the light wherever it may lead, or he can become his lawyer, and be revived by a transfusion of Vampyre Blood. The very last thing the young lawyer remembers before dying was his wife asking for a divorce, and prior to that he remembered being handed the prosecution of a mafia kingpin on his first day at the district attorney’s office. He wondered why the DA was so friendly to him, and so nasty to his star attorney Richard Bleddon, and he wondered why Bleddon had arranged a champagne supper at a fancy restaurant for him and his wife. After which, a speedy midget had snatched his wife’s purse and led him out into the street to die. Impatiently, the Count presses for an answer to his offer, and after being assured that he will not become a Vampyre himself, Brad accepts, hoping to return and make sense of the madness that brought him to the brink of death. 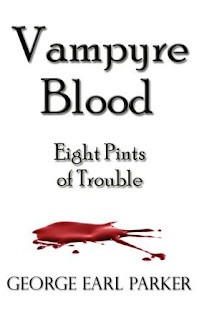 Populated by lovable rogues, scheming lawyers, and thieving gypsies, Vampyre Blood-Eight-Pints of Trouble is an insane romp through New Orleans, illustrating the intensity of our human desire to get what we want at any cost, and the strange places that desire can lead to. I wasn't sure what to expect from this book. I thought the concept was interesting and fresh, but was taken back by the humor I got. Not entirely in a bad way. I enjoyed the book as a humorish tale that shows the way people act. This isn't going to be for everyone, but I had fun reading it. I'll give it a 3/5 rating. Do you have a special occasion coming up anytime soon? Need some invitations or announcements? Just check out this place! 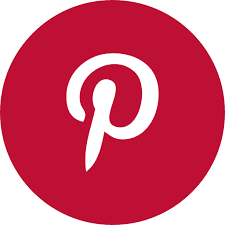 Picture Me Perfect has all sorts of neat ideas for anything ranging from 50th anniversary invitations, adoption announcements, and so many other choices that it would be impossible to list! I loved the adorable birth announcements and wished I could have known about this store when I had my child! Also if you need a special adoption announcement check out their selection too! The BEAUTIFUL announcements for weddings and showers are also simply to die for! Just look at the assortments of ways to save your memories! Next time you have a party or announcement think of Picture Me Perfect! Bestselling author Beth Rider enjoys her fame as the South’s newest literary star. That is until Jack Dawn, a real-life vampire, vows to kill her because of the vile redemptive message her book is bringing his people. The ancient race of bloodthirsty immortals to which Jack belongs, known as the Rakum, have spread evil among mankind since the Beginning. But Jack alone recognizes the novel’s destructive potential and she must die. Jack’s proselyte Michael Stone was brought up from his youth to be strong, sensible and brutal. But at one hundred and thirty, Michael is old enough to appreciate his quiet and ordered life. When he stumbles upon the beautiful and apparently innocent Beth Rider, he is puzzled by his Elder’s unreasonable actions against her. Instantly smitten, Michael takes it upon himself to protect her from the limitless lust of his brethren. Facing the most terrifying trial of her life against creatures known only in fables, one simple woman will threaten the existence of a powerful and accursed people. In the climactic final battle, it is a race to the death, or if Beth has her way, a race to the life—of every Rakum who makes the choice. This is certainly a fresh new approach to the vampire genre. I definitely enjoyed that about it! 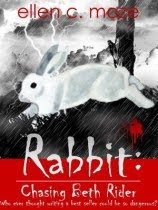 It is very well written and the characters are interesting and real. I wasn't as wowed by it as I wished I could have been, but that doesn't mean this wasn't a good book. I do think this book will delight fans of the vampire genre both old and young alike! I'd give it a solid 3.5/5 rating! Check out the book's webpage HERE! In the early 20th Century, a pair of North Carolina mountain children sow the seed of a love that becomes their only solace in the hard yet beautiful world they know. They grow it from steep ground of poverty, ignorance, and violence. A landscape so brutal it can kill hope long before claiming life. Bloodshed years later finally sends Frank Locke on the run, deep into wilderness, abandoning his extraordinary love, Mary Lizbeth. When a whitewater river washes this desperate soul into the hands of Sophia, he discovers a luminous woman steeped in mystery, trapped in a tragically brilliant life. Far ahead of her time. Secreted from the world. As she awakens Frank's mind, they rise to meet a love that binds three people for a lifetime. This love triangle forms a beauty no one sees coming. From the wilds of Appalachia, crossing nearly a century, it runs deep into a lush American fortune, and lives in letters of adoration and hope of the least expected. In a rhapsody of Southern voices, mingling hilarity and sorrow, She-Rain speaks of lives soaring beyond heartbreak, fundamentalism, and self-destruction. Through the most graceful longing, two women in love with one man ultimately prove the power of human hearts to answer high callings. They show us all how to heal -- and thrive -- to the very end. 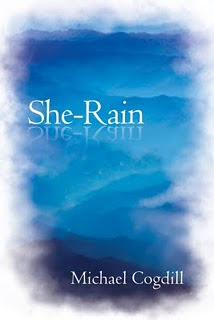 She-Rain is definitely a story of hope and love. I was quickly taken in by the story and the characters. is crafted so perfectly. Each page immerses you deeper and deeper into a great love story. to bring his ideas to life, and it worked! I'm definitely a big fan now! Ever since, Cassel has carefully built up a façade of normalcy, blending into the crowd. But his façade starts crumbling when he starts sleepwalking, propelled into the night by terrifying dreams about a white cat that wants to tell him something. He's noticing other disturbing things, too, including the strange behavior of his two brothers. They are keeping secrets from him, caught up in a mysterious plot. As Cassel begins to suspect he's part of a huge con game, he also wonders what really happened to Lila. Could she still be alive? To find that out, Cassel will have to out-con the con-men. So yeah read this book! 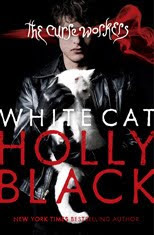 Plus I totally think the guy on the cover is hot..and his kitty is adorable! :)> Obviously I give this book high ratings and recommend it! I love LOST so this had me laughing sooo hard and I have no idea why! See I told you guys that I'd have something to giveaway! So here it is! 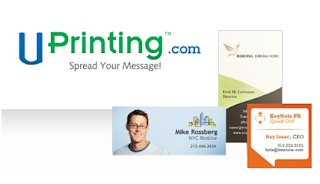 Uprinting.com is a super cool website that you can use to make custom Business Cards online and all your other Promotional printing needs. There! That's all you have to do! This giveaway ends on March 21st at midnight (CST) and the winner (ONE WINNER) will be notified on the 22nd and given 24 hours to respond. This book was a bit slow at first, but certainly picked up speed as you go along. I've played World of Warcraft so the names and places were familiar as I read the story. I really enjoyed how in depth this book went. The story really had me craving to roll a Night Elf character again! 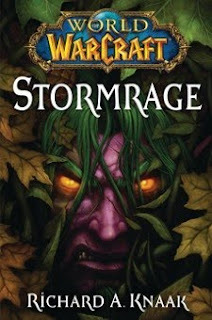 I'd definitely recommend this book to anyone that loves WoW or is just a fan of fantasy! A very good book for the gamer in your life! The Impostor is an inspiring story of how one juvenile delinquent turned his life around and became a successful and happy business man. turned anyone into a life-long criminal (if they made it to adulthood.) This is a great "how to change your life" story with many good lessons, but definitely not preachy or dry. This review is going to be short but sweet! 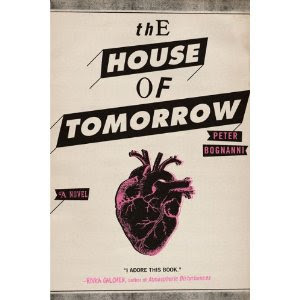 The House of Tomorrow by Peter Bognanni is a wonderful book! I totally was not expecting to fall in love with these characters! The story is fresh and beautifully written. I loved each and every page and was so sad to see it end! Bognanni is definitely one to watch in the future as I can see that he has a TON of talent! I'd definitely recommend this book! That's all I can say! What's Coming Up in March? Los Angeles Lakers Tickets for a very decent price! I'm not a game fan but I can definitely appreciate that! They have tons of venues to pick from when you wanna get Jersey Boys Tickets too! That is if you're into live musicals! I know I would love to catch this show! So you see there are tons of excellent shows, concerts, and plays to choose from! is in the market to purchase Taylor Swift tickets the click the link and shop away! Okay people, I have to admit. I have always wanted to be a magician! There I said it! I love magic tricks so when I stumbled upon The Magic Warehouse I was tickled pink! There are tons of amazing magic tricks to look through. I found that there were tons of stuff to buy in regards to magic! It's a veritable pot o' gold if you are into this stuff! Warehouse and see if you find anything magically fun! This is the second book in the Wheel Of Time series by Robert Jordan. Rand and his friends are out to find the Horn of Valere, that was stolen by an evil man. I loved how Jordan writes! I love how much more character development we got to see. Each character is woven into the pattern, as it is called, and each plays an integral part in saving the world. Rand's dilemma is intense. He has a calling but doesn't want to face it. He is definitely a tragic Hero type of character, but it's not overdone. He makes his choices and deals with the consequences. I'm reading this series to be a part of the challenge (look to the right sidebar) and I just cannot wait to delve deeper into this world! The only problem I had with this was the length. This is an epic tale and the size of the book is HUGE! There were a few slow moments where I thought it could do with a bit of trimming, but that didn't kill the story. I will give this one a 4/5 rating and suggest this series (so far) to anyone that loves a good fantasy story! Fun Little Poll-What Kind of Reader Are You? March is here! I'm going to pretend that February didn't happen. I've seen other blog owners mention that they had a little bit of a slump last month and I do believe that was my case as well. I didn't get much reading done. This month however things in my personal life seem to be improving drastically! I have to catch up on some review books and a couple of challenges but I think this month will be a good reading month! I'm ready for action!